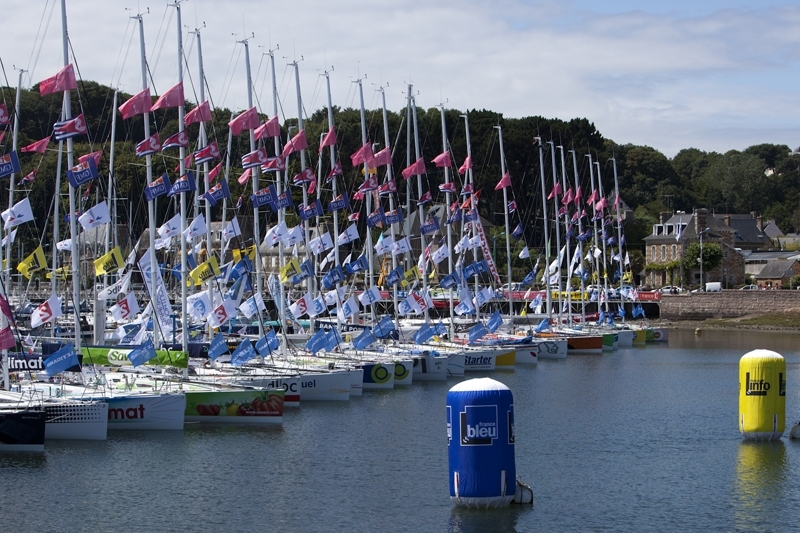 The picture perfect town of Perros-Guirec in Northern Brittany has been a hive of activity since the Solitaire du Figaro race village opened and boats arrived last Saturday. The marina is full with the skippers making final preparations to their boats and the Race Village is bursting with activity. Final security and measurement checks are being made, moments of rest and concentration for others as they plan ahead to the Eric Bompard Cachemire Prologue race, scheduled for Friday 28th at 17:30. All 47 skippers, from first time participants to experienced aficionados, took part in the welcome briefing held yesterday before completing registration and the compulsory measurement and safety checks. “We’ve already checked twenty boats, measured 13 genoas and 11 jibs”, explained Michel Perrouin, the event measurer, this morning. There are 9 volunteers and 3 professionals who still have a busy schedule inspecting the 50 odd sets of safety equipment on each of the competing Figaros. They have to brand the boats, ensure that the Eric Bompard Cachemire sponsor’s stickers on all the fore-sails (genoas and jibs), and verify the onboard communications instruments (VHF, AIS). Measurers, organisers, technical team all have to work in strict co-operation in order to ensure the skippers safely and provide for the best possible racing which starts next Sunday, 31st July. Previous Article La Solitaire du Figaro 2011 : Ça s’active sur le port de Perros-Guirec !